Polk County public school officials say more than 80 schools have been cleared after a recent round of tests looking for lead in drinking water. Several Polk County schools tested positive for lead in 2018. The district began water tests at schools last fall after Hillsborough County Public Schools found high levels of lead at some campus schools. Initial tests at buildings for students pre-kindergarten through 12th grade are complete. There are about 150 schools in the district. District maintenance manager Rory Luce said water testing at 28 schools will continue through the month. District officials estimate the total cost for testing water sources at schools will be more than $250,000. That number does not include estimates for replacing fixtures. Luce said the school district took water sources showing high concentrations of lead out of service until tests show the water is safe. Safe levels of lead concentrations in drinking water should not exceed a total of 15 parts per billion, according to EPA recommendations. The agency reports exposure to the toxic metal could lead to damage to the nervous system and other problems, especially in infants and young children. “Everything that has cleared to date is below that mark. And, hopefully we’ve resolved all the issues and concerns that parents and staff have had with water testing,” said Luce. In the most recent round of testing, the district began with older schools. Some of the highest concentrations of lead were found at Winston Academy of Engineering and Cleveland Court Elementary in Lakeland, Inwood Elementary in Winter Haven, and Union Academy in Bartow. All those schools have since been cleared by the district and have safe water for drinking and cooking, according to an online update by Polk Schools. 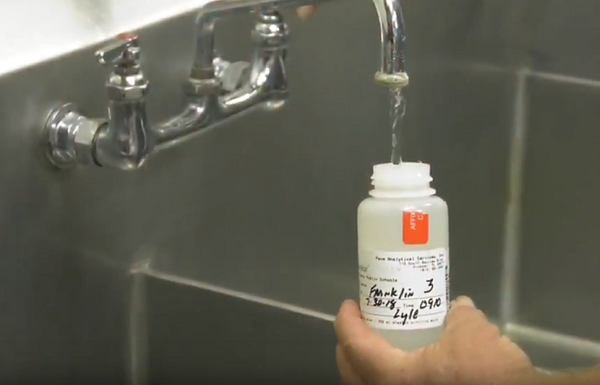 Lab results provided by the district from November show Ridge Technical College in Winter Haven had some of the highest levels of lead in drinking water. One water source there showed a lead density in the water of 4,260 parts per billion. A number well over the acceptable limit. Higher lead levels can sometimes occur because of the age of a building. The last district-wide lead test was in the 1990s. At Hillsborough County schools, officials tested 11,595 fixtures at its 251 facilities. A December update from the district reported a little more than 200 fixtures had lead concentrations above 15 parts per billion. Of the fixtures that exceeded the safe limit, 40 were drinking fountains. Other issues were found at hand washing sinks or backflow prevention devices that are used to protect potable water. Students and staff can only use water fixtures at Hillsborough schools that have passed water tests. Polk County Schools has the same policy. “Once (tests) come back cleared, we put the fixtures back into service and we move on,” Luce said. WUSF intern Nicole Slaughter Graham contributed to this story.